James “Shimmers” Louis Cassidy, 72, of Babb, passed away Tuesday, April 2, 2019 at a local care facility in Great Falls. A Viewing will begin Friday, April 5th at 12 noon at the Babb United Methodist Church in Babb, MT with a Rosary to start at 7:00 PM. His Funeral Service will be held Saturday, April 6th at 11:00 AM at the Saint Mary Catholic Church in Babb. Prior to the Funeral Service, Military Honors will be held for Shimmers as he leaves Babb United Methodist Church. Born on December 10, 1946 in Anaconda, MT to Warren and Mary Lou Fiddler Cassidy, Shimmers was raised in Babb, MT and graduated from the Flandreau Indian School. He married Viola Rose DuBray on March 9, 1974 in Cardston, Alberta. They had 37 wonderful years together, living with their children in various places in the Rocky Mountain region, but Babb was always home. Shimmers served in the U.S. Army during the Vietnam War, earning a Vietnam Service Medal, National Defense Service Medal, Combat Infantryman’s Badge and a Vietnam Campaign Service Medal. He worked for the Federal Highway Dept., Cassidy Trucking, and Cassidy Fencing during his 62 years in the work force. Along the way he was a Wrestling Coach for his Babb Mustangs, even taking the team to State Finals. He liked four wheeling in the hills, even when he got stuck, and cruising along at 2 knots around St. Mary’s Lake. He loved playing drums in high schools and country dancing with his sweetheart Vi. He was also very active in the Vietnam Veteran Association. 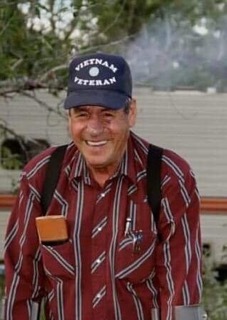 Survivors include his sons, Hyrum Braverock and Troy (Donna) Woodward; daughters, Melisa Woodward, Jamelle (Gene) Blythe, and Sabra (Otis) Norunner; sister, Letha Arcand; brothers, Robert Cassidy, Allen Cassidy, Elliot Cassidy and Eldon Cassidy; 25 grandchildren and 29 great-grandchildren. Those who preceded him in death include his parents, his beloved wife, Viola; daughter, Ann LaRae; sister, Rose and brother, Jerry.